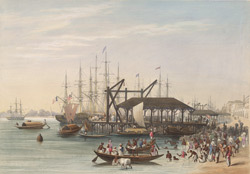 This coloured lithograph is taken from plate 4 of Sir Charles D'Oyly's 'Views of Calcutta and its environs'. It shows a forest of masts on the River Hooghly at Custom House Wharf, adjoining the esplanade walk at Chandpal Ghat. Bishop Heber of Calcutta wrote: "a very handsome quay is continued along this side of the river ... and it bids fair to be a very great additional ornament and convenience to Calcutta. Vessels of all descriptions, to the burden of 600 tons, may lie almost close up to this quay, and there is always a crowd of ships and barks."